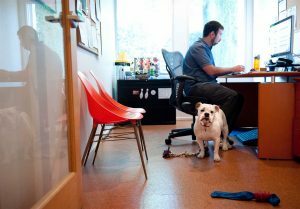 Pets at work are comparatively more common today as they were a decade ago mainly because employers are realizing the benefits of a pet on the business’ productivity. Others just show compassion and honor the needs of their employees. Bringing along your cat or dog to work would be awesome, but looking from a legal standpoint, it is not allowed. The Americans with Disabilities Act sees emotional support animals as a source of sheer comfort, unlike service animals, and therefore don’t allow them in public places, such as offices, restaurants, hotels and shopping malls. Relieves Stress – Allowing ESAs in offices minimizes tension and makes employees more comfortable in the workspace. A study published in 2012 by International Journal of Workplace Health Management concluded that people who brought their emotional support dogs to work experienced lower hormonal stress levels in comparison with those who didn’t bring along any pets. In fact, individuals who didn’t bring their pets showed slowly increasing stress levels throughout the day. Encourages Positive Interactions – An ESA friendly environment tends to improve worker satisfaction and morale. ESAs are also a common icebreaker and a great topic of conversation that can encourage an atmosphere of communication and teamwork. Reduces ESA Care Costs – Letting employees bring their ESAs to work offers them a substantial advantage. It reduces the extra costs of dog walking services or pet day care for workers who travel a long distance or work extended hours each day. Improves Company’s Image – Companies that allow pets are often rated highly by customers. Most customers react positively when given an opportunity to interact with a worker’s pet, and it also helps them enjoy and relax during their business visit. Having pets in the workplace softens the business’s image and makes it seem more forward thinking and progressive. Decreases Worker Turnover – Worker turnover is a big problem for companies, especially when they invest the resources and time to groom a new recruit who doesn’t stay for long. Allowing ESAs in the workplace can be an impressive feature for animal owners, and this can somewhat solve recruiting problems. Improves Employee Performance – Employees at ESA friendly companies tend to have a lower absenteeism rate and work for longer hours. This is because they do not have to worry about running home to feed their emotional support animal or staying home and look after a pet that is ill. Your ESA is well behaved. If you will be bringing a dog to work, make sure it doesn’t growl, bark or create a disruptive work atmosphere. Constant supervision. ESAs must be kept under control at all times, and not roam around the offices unsupervised. Your ESA is healthy and vaccinated. Make sure your ESA is healthy to minimize the risk of him getting sick from something or someone. Check your insurance. Even the most well-behaved cats and dogs could become hostile in a unfamiliar environment, so ensure you are covered in the event your ESA acts out. Make sure no one has a problem with you bringing your emotional support animal to work.